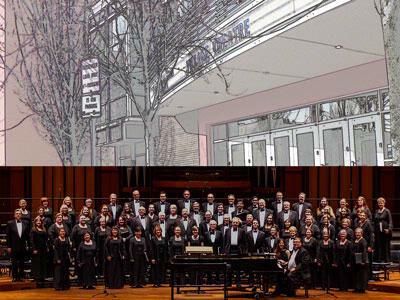 The Everett Chorale will present "Celebrate and Dance" at the Everett Performing Arts Center on Saturday, Dec. 5 at 7 pm and again on Sunday, Dec. 6 at 3 pm. This performance will mark the beginning of their 50th Anniversary Season. To mark the Chorale's golden anniversary, Artistic Director/Conductor Lee Mathews has planned a program that features choral music with a dance theme. Young dancers from The Dance School in Everett (www.thedanceschool.org) will perform scenes from the "Nutcracker Ballet" complete with words created by Fred Waring and his famous Pennsylvanians. Sapience Dance Collective (www.sapiencedance.org), a professional dance company from the Seattle area, has been commissioned to interpret the nine carols set to music by composer Lloyd Pfautsch in his cantata "A Day for Dancing". The Choral Arts Woodwind and Percussion Ensemble will provide the accompaniment. In addition, the 80-voice Chorale will perform a variety of secular Christmas songs which will bring back memories of days gone by and at the same time instill the joy and peace of Christmas present. According to Mathews, "the audience will want to tap their toes to "A Holly Jolly Christmas, hum the harmony parts to "Silver Bells" and raise their voices to "Over the River and Through the Woods" as the Chorale takes them on a fun-filled musical winter sleigh ride. The audience will get a chance to sing-along in the grand finale as everyone prepares to "Deck the Hall" and then greet each other with "We Wish You a Merry Christmas". "This is a perfect way to get your holiday season off to a rousing and spirited start", says Mathews. "After all, it is that time of the year to share the peace and joy of Christmas!" More concert and Everett Chorale information is available at www.everettchorale.org.